Welcome. If you are new here, pull up a chair. I am one of the few good SEO guys left out there and I focus on personal injury attorneys. The rest of this article is all about the SEO scene in Fresno as of October 2016. Fresno is a very interesting city to me. It is significantly less competitive than some of the cities I have worked with, yet there is population of over 500,000 people which is growing. I see Fresno as a big opportunity, and many attorneys from outside of Fresno do as well. There is no doubt in my mind that every single attorney in Fresno is well aware of the “outsiders” 200 miles away who are targeting Fresno with content marketing and SEO tactics to get them on the front page, sometimes targeting local search results/maps results via renting virtual / shared offices in the area, such as the Valley Oak Executive Suites or Boese Commercial. 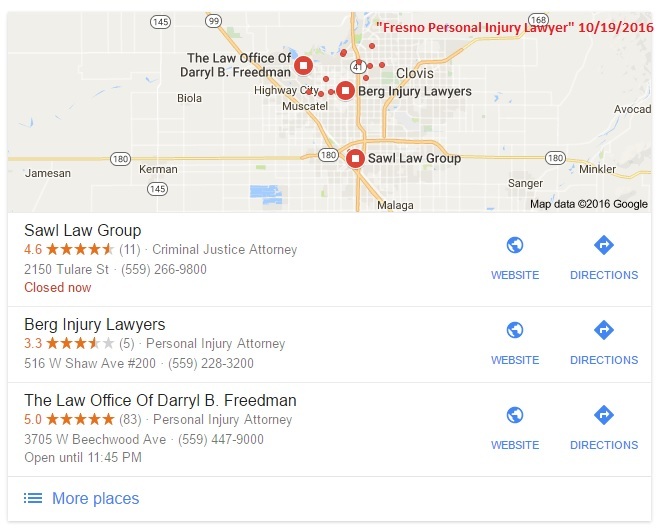 These rankings (eg: Fresno car accident lawyer) are incredibly valuable as once someone lands on a page, they are often going to make contact. Sure, some people are shopping around and comparing attorneys but plenty call the phone number of the first site they land on assuming you are competent and make a half way decent first impression; it’s just how it works. In California, this is unique to Fresno. I see “outsiders” in many parts of the country but not in CA. For reference, you can see what attorneys in San Francisco are up to. With the competition being less fierce in Fresno than it is in other cities, attorneys in LA with powerful websites have been moving in and grabbing organic traffic for terms such as “Fresno car accident lawyer” and also targeting Fresno with content marketing (articles about various types of injuries in Fresno). This happens because you need a really, really powerful site to rank in more competitive markets such as LA. Once your site is powerful enough, you can target nearby cities (or even distant cities – I know of attorneys in Utah targeting 4 states). Usually when this happens, many attorneys feel a bit helpless. But fear not, while Google will reward their efforts, if you are in Fresno and focused on Fresno you can always defeat or at least compete with the outsiders. Just below the ads and above the organic results are the local results, sometimes called the maps results or local pack. The local results, as of October 2016, are below and contain Sawl Law Group, Berg Injury Lawyers, and The Law Offices of Darryl B. Freedman. As you can see, Mr. Freedman has done an amazing job accumulating reviews. In cities such as Fresno, local results correlate with organic results, but changed in September along with the Google Possum update. Of course, these rankings are subject to change and do not reflect who is the “best” attorney. As of October 2016, here are the top results for “personal injury lawyer” minus sites such as Yelp, AVVO, FindLaw, etc. The Law Offices of Darryl B. Freedman Inc. This here folks is natural SEO- involvement in the community. I didn’t look at their backlink portfolio but it is safe to assume that this website has natural links from community involvement. This site has no blog – very rare for a high ranking site. This is a Joomla site, which is also rare. It works! Great job. Panish Shea & Boyle LLP (psblaw.com). Here’s a WordPress site with an active blog. Berg Injury Lawyers. Another WordPress site with an active blog. GJEL Accident Attorneys. WordPress website, active blog. Stephen P. Roberts. WordPress website, active blog. The May Firm. This is a nice looking WordPress website. And wow, the phone # at the top is clickable, thank goodness. It has blog functionality..
Timothy W. Mazzela. I have no idea what kind of website this is. Law Offices of Jeffery D. Bohn. This site runs WordPress. By now most injury attorneys know that they “need content”. But if you look at Google Analytics you will quickly see that articles like “10 tips to not get burned” will NEVER get read. They will also not improve rankings, and, most importantly, they are not going to result in cases. Unfortunately, there are content creators, SEO companies, and even attorneys out there that heard you need content from someone like myself, and then just ran and started spewing worthless content all over the Internet. Attorneys with blogs like this are really missing out on the SEO benefits and cases which come from content that people will find in Google search, read, and act on. What if I am injured as a passenger in Fresno? What if I am partially at fault for my Fresno accident? Fresno is an “easy” niche. No, you can’t just go rank overnight, but on a 1 to 10 scale where Chicago is a 10 and Timbuktu is a 1, Fresno is a 4. This is very, very rare in a city of 500,000 people. Freedman has the reputation but there is plenty of room for attorneys utilizing content. Law Firms could rank on page 1 with basic, ongoing SEO efforts from a good SEO team and easily compete with the outsiders. I have clients in multiple other areas of California which I am exclusive to but none in Fresno. I have assisted multiple attorneys in LA, work in Sacramento and other states along the West Coast. My content team understands CA injury law and I understand what it takes to rank injury lawyers. If you would like to rank better in search feel free to contact me. In this niche I would be thrilled to work with Freedman or get a qualified competitor leads ethically. I have been online since 1988, have plenty of references, and understand personal injury traffic better than almost anyone out there.